Some writers love researching for a new book almost as much as they enjoy writing the story. Others consider research about as fun as a deep cleaning at the dentist's office. I fit more closely to the first group than the second. Though my searches might not rise to the level of a historical romance writer looking into Regency-period dresses, I have spent many hours online, in libraries and in face-to-face interviews, researching everything from child-custody law and religious cults to hospice care and cake decorating. Maybe it comes from my background as a former newspaper reporter, but it's really important to me to get the facts right. To put as much reality as I can into realistic fiction. I also love talking to people about their lives, getting to see their world up close and sometimes even going along for the ride. In the case of my research to build strong police characters, that meant going on ride alongs in patrol cars. 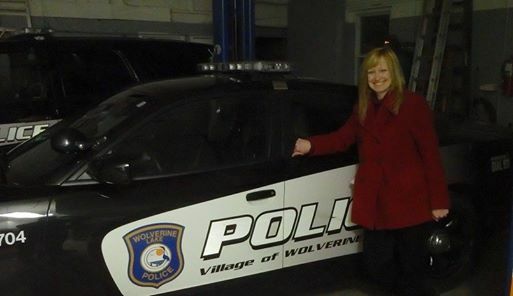 Over the years, I have taken passenger-seat rides with five police officers who worked in three different Michigan police agencies. (And only once was I forced to have the officer stop for Dramamine after a particularly fast and swervy ride.) It was great spending hours with these real-life heroes and learning about the work they do and the risks they take every day to protect the public. I hope I have conveyed some of their valor in my police characters, including Michigan State Trooper Shane Warner, the hero in my March Superromance release, FALLING FOR THE COP. In the story, Shane is recovering from a gunshot wound he receives while helping a domestic violence victim. I can easily picture any of the officers I met during my research making sacrifices just like Shane does in the story. Yes, ride alongs have provided great information to help with my books, but did I mention that I love research? I wanted to do more. 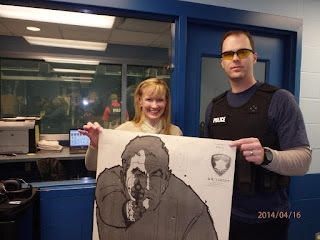 When I learned about the Lakes Area (Michigan) Citizens' Police Academy, a free 10-week course offered to area residents, I thought I'd died and gone to geek heaven. There was so much to learn whether I ever used it in a book or not. We had speakers on the canine unit, the bomb squad and crime scene investigation. We visited the county medical examiner's office and learned that you can't really solve the questions of a suspicious or sudden death during a one-hour TV episode. I loved it all, but I have to admit that my favorite part of the academy was having the opportunity to experience a few things for myself. I sat in the backseat of a patrol car (I swear it was the only time). I stood inside a holding cell next to a criminal court room. I even climbed into the driver's seat of a fire engine. 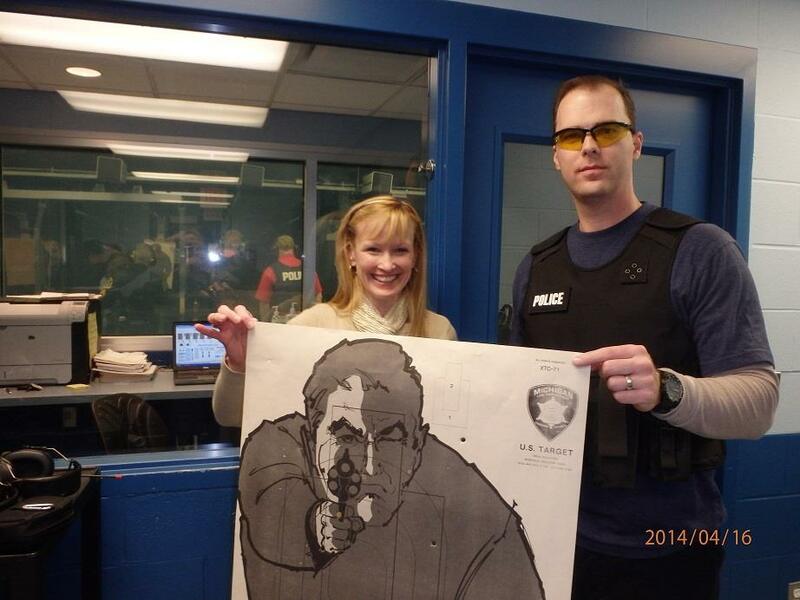 At the police shooting range, I had instruction and the chance to fire both a Glock and a Sig Sauer. 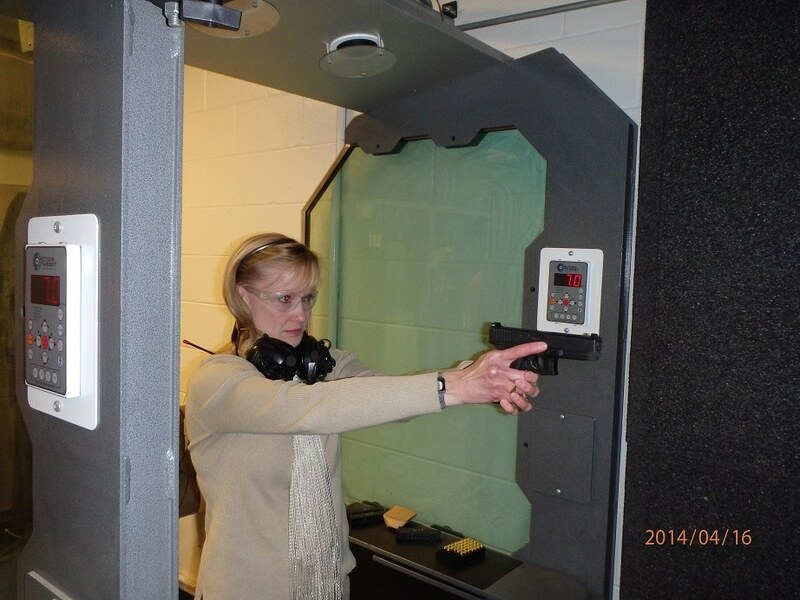 We even had the opportunity to use the police simulator, learning just how difficult it is to make split-second decisions about the use of deadly force. And, yes, I had my date with the Taser. They took volunteers, and after a couple of tough guys and a young woman hoping to enter the police academy took their turns, the officer asked if anyone else wanted to try it. My hand shot up. As nervous as I was, I knew I would be sorrier if I didn't take the chance while I had it. The officers told me it wasn't even a "full ride," just a touch of the Taser to my arm. But my legs dropped out from beneath me just the same, and, oh man, it hurt. As I sat down afterward and tried to write with a hand that didn't seem to be receiving messages from my brain, I came to one conclusion: I would do almost anything for my readers. So it's back to research again. This time on teen suicide, divorce during incarceration and identity theft. I know, I write about some heavy stuff. No, I don't plan to experience any of these things for myself this time. I did say I would do almost anything, right? I'll continue to searching for these answers, anyway, and I really want to get the details right. I write fictional heroes, but the people they represent are the real thing. This research certainly sounds like a lot of fun. Not sure I'd be game enough to be tasered. Fascinating research you've done! My favorite research has been the trips we've taken out West to see the places I wanted to write about. The best research trip was actually after the fact. I'd written about an abandoned cabin in the hills that I totally made up, and then last year we actually went to one while visiting the Tetons. It was amazing to suddenly realize what I'd imagined was really there. I recently researched (online)current pregnancy tests and how they work. Since it's been 32 years since I used one, I needed to know what's new. It was interesting to discover some can now give you an idea of far along you are, without visiting the doctor. Worked out well for my story! Look forward to reading your next Super. Great recap, Dana! I'm a research junkie, too, so I know how you feel about Just the Facts. You look very capable in the photos. That should scare your children into behaving. Hmmm, Lucy. Wonder where you're headed with the pregnancy story. That's cool about the abandoned cabin. dstoutholcomb, my husband couldn't believe I did it, either. I'm not usually a daredevil. Thanks, Nancy, my kindred spirit. Note in the photo I forgot to put my protective ear wear back on. The photo is staged, of course, since no one was dumb enough to stand out in the shooting range while I practiced. Dana!! I can't believe you got yourself tasered. On a volunteer basis, of all things. I would have been the one quietly scuttling to the back corner when they asked for volunteers. I shocked myself on the dryer once and it was enough for me!! Interesting post, thank you for sharing! Oh my goodness. You are so brave! I would never volunteer to be tasered and I'm really impressed that you did! Great blog post, go Dana! !